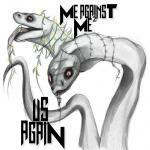 Sign up for Broadjam today to follow Me Against Me², and be notified when they upload new stuff or update their news! Our first album shows the versatility of our style and features our lead singer, Stephanie C-g with her Evanescence / Halestorm sound showing off her pipes and her lyrics. We also have featured Chuck Raycraft on Run for Your Life where he wrote the lyrics and sang. Finally we were pleased to have Travis Keziah from Shadow of Myself (writing lyrics and singing) as well as the band's lead guitarist, Brian Baker. Scott Cilluffo finally shines as a songwriter and guitarist on this album and lyric writing talents on two songs. You will also note Nolan Lawing on the drums and Eric Stine on keys. Last but not least Jamie King, the master producer and bass player. I can't help but to mention J T Terraglio who was featured on I'll Ruin Your Day with killer lead guitar riffs. If you like the cover/art work, check out Scarlett Raleigh and Chloe Brock. A woman who is in an abusive relationship, who feels upset because it was not what she thought it would be. She feels upset and deceived by what it turned in to and is ready to walk away after too much time had passed. Scott wrote the song after knowing family members who had experienced being in abusive relationships, Stephanie helped him to polish the lyrics and added to them. A man leaves a relationship after making all appearances of being ready for a long term relationship and then suddenly ends it leaving the woman feeling distressed and depressed about her judgement and betrayed by how he manipulated her feelings. A girl is disheartened by her boyfriend and his behavior and feels she has to get away from it and him, however she can and soon. A young man makes his girlfriend feel like she is in a good solid relationship that is going somewhere but suddenly finds that all she thought she knew was nothing but lies. She feels nothing but betrayal, heartbreak and anger and wishes him nothing good for future relationships. Young woman is distraught by how a relationship goes from really good one day to over the next, she feels betrayed and lied to over time. In order to survive life's journey you cannot do it alone. The song was written after the songwriter experienced a brain tumor and realized of course that without prayer/God in his life he could not get through the hard times. Girl finds someone who will open her up to love again. The Song is about a relationship where the man lies and makes the woman feel as if there is something wrong with her and manipulating her. She finally gathers her things together and runs as fast away and far away as possible, knowing she will never go back. It holds a place in the Vocalist's heart...obviously not a great memory unless you look at the bright side that she had the guts to realize it was wrong for her and she got out and did not come back. A young girl who was bullied relentlessly for various things. It is about how she endured and overcame and how you can too.